Download current and historical issues. Sign Up Now to receive a free 14-day trial and complimentary Weekly Market Newsletter. Premium membership on ValuEngine.com gives you the complete ValuEngine toolbox. You'll have everything you need to make the VE Stock Evaluation Models work for you and substantially increase your chances of success in the Market. Click HERE for more information. This is the product of a sophisticated stock valuation model that was first developed by Yale Professor of Finance Zhiwu Chen and his coauthors. ValuEngine and other providers deliver real-time independent and industry research valuations on more than 10,000 U.S. companies in 200 U.S. industries, totaling some 20,000 reports. ValuEngine Reports are distributed through reputable Financial media such as Reuters, Yahoo! Finance, CBS MarketWatch, Hoover's, BNY Jaywalk, Thomson Financial, Investrend.com etc. and widely referenced by Finance Industry professionals. VE Institutional's objective is to provide customers with immediate, efficient quantitative tools for analyzing stocks and equity portfolios to create maximum return for minimum risk. Register Now to download free trial demo. 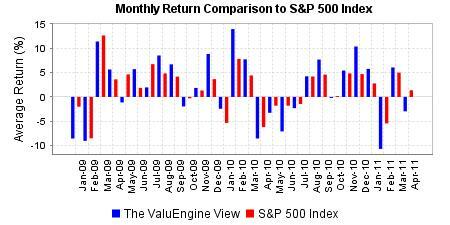 ValuEngine does extensive work with hedge funds and other institutional level investors. Each project varies and generally involves a customized daily or inter-day feed of ValuEngine's Valuation and/or Forecast data. Subscribers click HERE to login.